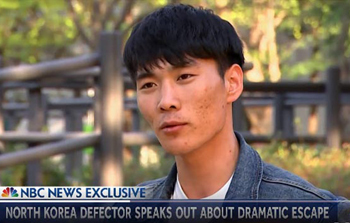 North Korean defector Oh Chong-song speaks in an interview with NBC on Monday, in this grab from the U.S. broadcaster's website. A soldier who fled North Korea through a hail of bullets in November 2017 made his first TV appearance on Monday in an interview with the U.S.' NBC. Oh Chong-song said his decision to escape was "spontaneous." "I crossed the border at 3:15 p.m., but even that morning I had no thought of going to the South," he added. Asked if he is enjoying his new-found freedom, he said yes. 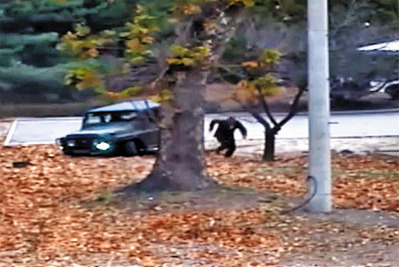 Oh admitted to being "extremely terrified" when he drove through the inter-Korean border at Panmunjom in a jeep. "I watch this video [showing the escape] once in a while and every time I see it, I realize the fact that I am alive is a miracle. Even I can't believe something like this happened... I can't believe it's me in the video." If he had been caught, he "would have been either sent to a concentration camp for political prisoners or, worse, executed by firing squad," he said. But he has forgiven the North Korean soldiers who riddled him with bullets. "If I were in their shoes I would have done the same thing." Oh was in critical condition for several days, and made further headlines when a large number of parasites were found in his intestines, which highlighted chronic malnutrition and substandard medical care in the North.